Prithviraj bagged the Best male actor award for the movie 'Celluloid' and 'Ayalum Njanum Thammil' and Rima Kallingal was awarded the best female actor award for the movie '22 Female Kottayam'. The Best Director Award went to Lal Jose for the movie 'Ayalum Njanum Thammil'. Anjali Menon was adjudged the Best Script writer for the movie 'Manjaddikuru'. Manoj K. Jayan was announced as the Best male Supporting Actor and Sajida Madathil the Best female Supporting Actor. Salim Kumar was selected as the Best Comedian in the movie 'Ayalum Njanum Thammil'. 'Black Forest' was selected as the Best Children's movie and Best Child Artist awards went to Vinod and Vyjanthi. The Best Music Director Award went to M Jayachandran and the Best Playback Singer (male) went to Vijay Yesudas and the Best Playback Singer (female) to Sithara. 'Ayalum Njanum Thammil' was selected as the Best People's choice Award. The Jury's Award went to Jayan Cherian for the movie 'Pappilo Budha'. The jury's award for the Best male and female singers went to Sreeram and Vaikom Vijaylakshmi. 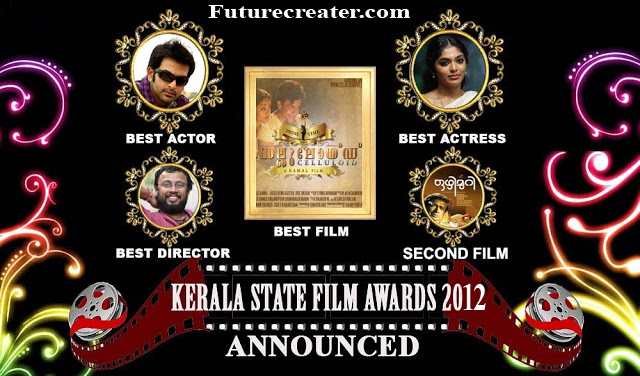 The winners of Kerala state film awards 2012, presented by Kerala film academy was declared on Thursday. An eight member jury chaired by I. V. Sasi viewed 84 movies shortlisted for awards Wednesday . Jury opined that it was very difficult to reach consensus, as two or more persons were on par with the best in each category. Last year was absolutely fruitful to Malayalam film industry with experimental movies and hence tough competition was seen in the categories such as The Best Cinema, The Best Director, The Best Actor and The Best actress. Thilakan, Prithviraj, Fahad Fazil, Lal, Prathap Pothan, Dulquer Salman and Sreenivasan were among the competitors for best actor and supporting actor awards whereas Rima Kallingal, Swetha Menon, Kavya Madhavan, Aparna Nair, Anumol, and Shamna Kasim contested for The Best Actress and The Best Supporting Actress awards. 'Shutter', 'Celluloid', 'Bhoomiyude Avakashikal', 'Ayalum Njanum Thammil', 'Ustad Hotel', 'Arike', 'Ozhimuri', 'Diamond Necklace', 'Ee Adutha Kaalathu', 'Chayilyam', 'Ente', 'David and Goliath'. '22 Female Kottayam', and 'Spirit' were in the front row for competition. In this situation it was extremely difficult to find out The Best Motion Picture and The Best Director. Members of the jury are director I.V. Sasi, director Sibi Malayil, cameraman Vipin Mohan, music director R. Somasekharan, Jayashree Kishore, Editor Ramesh Vikraman, Actress Surekha, and Film Academy Secretary K. Manoj Kumar (member secretary).